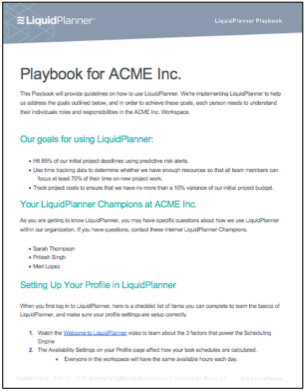 This Playbook Setup Guide will help you get started on creating your LiquidPlanner Playbook -- the guidelines for your team on how to use LiquidPlanner. 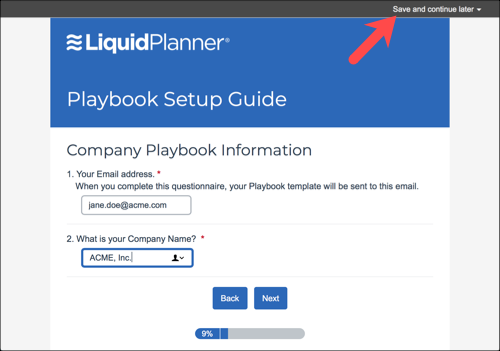 This Setup Guide includes several questions to help you outline the individual roles and responsibilities for team members in your LiquidPlanner workspace. You'll probably need to take some time to consider your business rules, and discuss them with stakeholders and managers involved in your LiquidPlanner implementation. What do I receive from this Guide? How do I pause working on this Guide? This questionnaire is set up so that you can pause and save your work along the way. Click on the "Save and continue later" button in the top right corner at any point. You will receive a private link to return to the survey whenever you need to.